Our strong, metal boxes can be used to secure anything - legal documents, family heirlooms or valuable collections. You can access our safe deposit boxes during regular lobby hours at our Rosedale and Lamar branches. There's a refundable key deposit of $10. Peace of mind comes from letting us lock up your valuables. 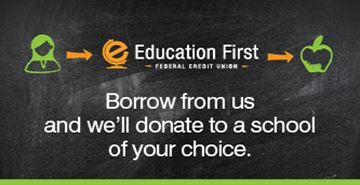 You already trust Education First with your financial needs. We also can safeguard important documents and precious possessions. Just choose the safe deposit box size that's right for you.